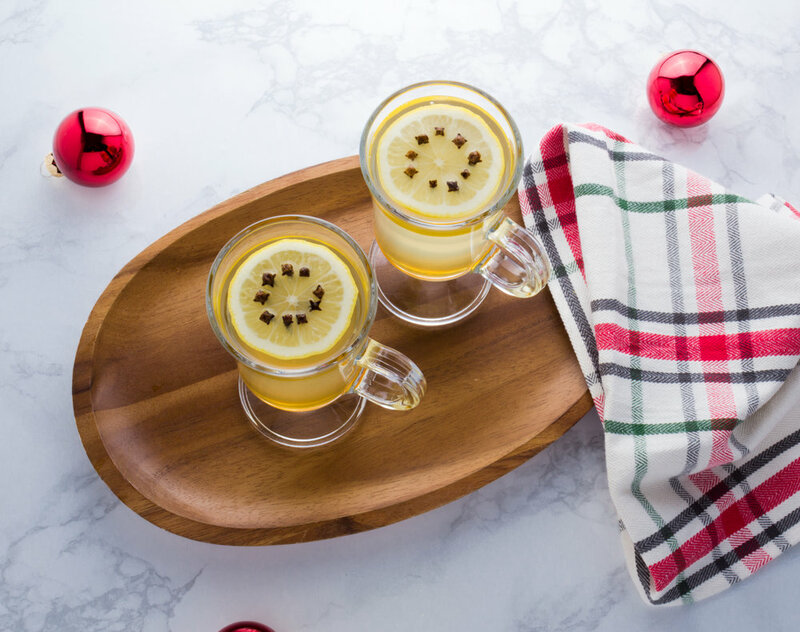 Warm and comforting, the Classic Hot Toddy is a perfect holiday cocktail that uses honey as opposed to refined white sugar to make it sweet. Healthier Holiday Cocktails: Even though I'm a health coach, I believe in balance and for me that means enjoying a nice cocktail or glass of wine with friends. With the holidays upon us, I'm sharing my favorite healthier cocktail recipes every week in December. Cheers! The thought of one makes me think of snowy days, sitting by the fireplace and spending time with family. Well, that is why it's one of my favorite holiday cocktails. Plus, as it traditionally uses honey as opposed to refined white sugar, I know it is a slightly healthier option. It also doesn't hurt that I usually have a chill this time of year and a few sips takes that right away. While there are lots of folklore and variations of the Hot Toddy, I keep mine fairly straightforward but that doesn't mean you can't try out new flavors! Spices like cinnamon or star anise, fresh grated ginger or even turmeric for another healthy addition all work wonderfully. Play around with the ingredients and see what works for you. And while you are at it, try out different liquors as well. I prefer bourbon but you can also try whiskey or even rye. The recipe for my Classic Hot Toddy is below but be sure to also check out the video below where I take you through the steps one by one. Don't forget, I'll be sharing my favorite healthier, holiday cocktails every week for the rest of December. Be sure to follow me on Instagram to get all of the posts or subscribe to my YouTube channel. 1. After slicing your lemons, place half of the cloves into each of the lemons. 2. Add the lemons to a heatproof glass or mug (an Irish Coffee Mug is perfect this). 3. Pour the bourbon and honey into each glass before pouring the hot water over each. 4. Stir gently before serving. Cheers!